Image caption Is the rhetoric returning to the big guns? North Korea's foreign ministry has lashed out at the US for not lifting sanctions against the country. It said it had made various goodwill gestures but the US was still following an "outdated acting script" and jeopardising any progress. South Korea says it has caught three companies importing coal and iron from North Korea in breach of UN sanctions. The US wants full nuclear disarmament before sanctions on the North can be lifted. 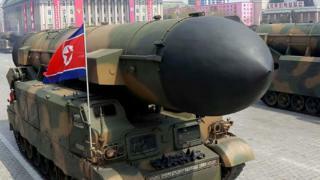 But the details of that process remain vague - North Korea did not commit to unilaterally giving up its nuclear weapons. Last week, a leaked UN report said the country had not stopped building weapons - which prompted the US to call on the international community to keep enforcing sanctions. North Korea's foreign ministry cited various conciliatory moves it said the country had made: halting missile tests, the return of the remains of US soldiers killed in the 1950-53 Korean War and the dismantling of a nuclear site. It said the US was clinging to an old script that "all previous administrations have all tried and failed". It also accused US officials of "going against the intention of President Trump" by "making baseless allegations" and "desperate attempts at intensifying the international sanctions and pressure". It said "expecting any result, while insulting the dialogue partner" was a "foolish act that amounts to waiting to see a boiled egg hatch out". Earlier this week, North Korea's foreign minister called US actions "alarming". And last month, North Korea accused the US of using "gangster-like" tactics in the negotiations. Pyongyang's Foreign Minister Ri Yong-ho is currently on a visit to Iran where President Hassan Rouhani warned the US could not be trusted after Tehran's experience of having the Trump administration tear up an Obama-era deal to ease sanctions. "Since we know that the US will never give up its hostile policy toward us, we will hold onto our nuclear knowledge," he was quoted as saying by local media. Top diplomats from the US have strongly questioned the North's commitment to denuclearisation. National security adviser John Bolton said earlier this week North Korea had not begun the progress, while the US envoy to the UN, Nikki Haley, said Washington was "not willing to wait for too long" for the North. Last week, US Secretary of State Mike Pompeo said it was important to maintain "diplomatic and economic pressure" on North Korea. Media captionNukes, Trump Towers and human rights - what might peace look like between the US and North Korea? How were the sanctions allegedly breached? Seoul's customs office said the latest North Korean coal and iron imports had first been shipped to Russia to disguise their origins. It is thought the three companies involved were hoping to make a large profit, as the price of North Korean products fell after the introduction of the UN sanctions. The UN has previously responded to ships violating the sanctions by issuing them with a ban on visiting any global port. 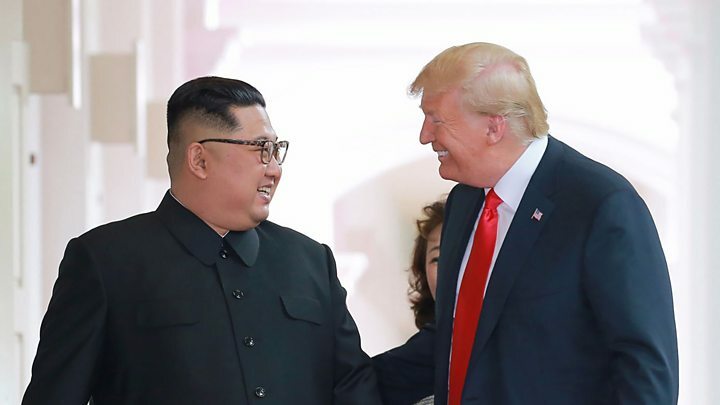 Andray Abrahamian, a North Korean specialist at Australia's Griffith University, said neither the US or North Korea seemed clear on what was the fair way to proceed. "Nor is either side able yet to articulate what the end state of a peace regime will look like either," he added. "I think both are afraid that articulating it is a set-up for a loss. We need some kind of simultaneous concession on both sides to get this process moving again." Peter Ward, a writer for NK News, told the BBC: "It is interesting that they are accusing members of the administration of going against the wishes of President Trump. It looks like they are trying to sow discord inside the administration and push for greater compromise. "They probably want another summit, and would like Trump actively involved in the process." Video US and North Korea: What might peace look like?